The Whole Brain Model was developed by Ned Herrmann. 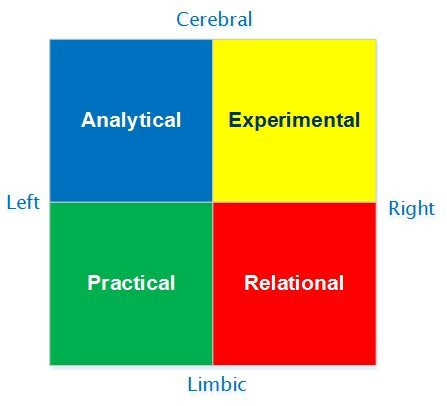 Herrmann created this metaphorical model to illustrate that each person’s brain basically has four quadrants when it comes to the process of thinking and learning. 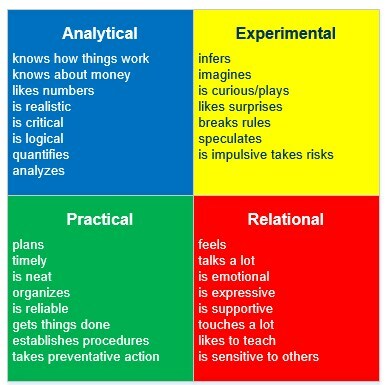 Each of these quadrants are characterized by different learning or thinking styles. 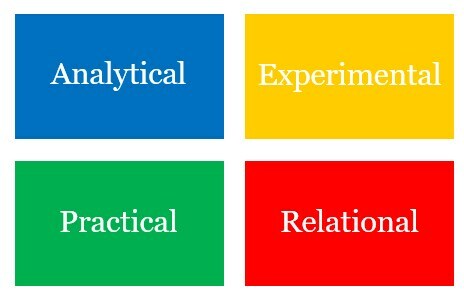 Depending on which quadrants you engage, your learning and thinking processes can be significantly different. Herrmann’s Whole Brain Model combines Roger Sperry’s split brain theory and Dr. Paul MacLean’s triune brain model. Sperry’s split brain theory divides the brain into two hemispheres; right and left. Each hemisphere is specialized for some behaviors and controls different types of thinking. The left brain is believed to be more logical, analytical, and objective. The right brain is said to be more intuitive, creative, emotional, and subjective. MacLean’s Triune brain theory suggests that humans have three brains; the reptilian brain, the limbic system, and the neo-cortex. Both the limbic and the neo-cortex have two halves, a right and left side. Reptilian Brain controls the body’s vital functions such as heart rate, breathing, body temperature, and balance. Limbic System is the middle part of the brain, and is concerned with emotions, instincts, feeding, fighting, and fleeing. This system controls the body’s autonomic nervous system. Neocortex controls the higher cognitive functions which distinguish Man from the animals. This is the “thinking cap.” It is responsible for functions that are considered uniquely human such as abstract reasoning, aesthetic values, judgment, and language. Herrmann’s combination of theories produces a quadrant model of the brain. This model has two halves of the cerebral system and the two halves of the limbic system. Herrmann’s theory allows us to differentiate between the left and right brain, as well as the concept of cognitive thinking and emotional response. Our upper brain is believed to control our intellectual process (cerebral thinking), while our lower brain (limbic system) controls our emotional response such as anger, happiness and fear. Depending on which quadrants you engage, your learning and thinking processes can be very different. Herrmann characterizes the upper left (A) quadrant with logical, analytical, quantitative and rational thinking, and the lower left (B) quadrant, with the abilities of planning, organizing, focusing on detail, and sequential thinking. The lower right (C) quadrant controls emotions, feelings, interpersonal skills and kinesthetic, while the upper right (D) quadrant is responsible for holistic, imaginative, intuitive, integrative and synthesizing processes.